Cancer caused by environmental factors. Epigenetics acts as cancer trigger. Epigenetics is being associated with numerous health conditions and diseases including cancer. It is defined as changes in gene expression caused by the environment. 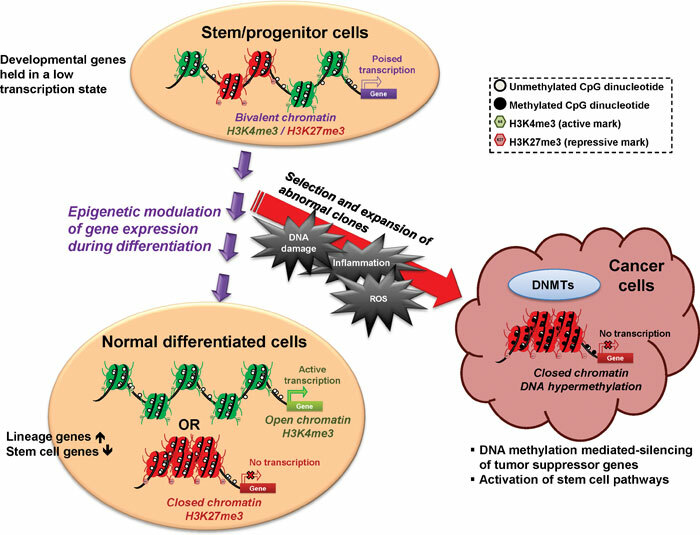 The most common form of epigenetics consists of methylation, the addition of an methyl group (or molecule) ncer has long been thought to be primarily a genetic disease, but in recent decades scientists have come to believe which acts as a switch to turn cancer on and off. Researchers at the USDA/ARS Children’s Nutrition Research Center at Baylor College of Medicine and Texas Children’s Hospital have tested the cancer epigenetic theory in a mouse model providing the first in vivo evidence that epigenetic alterations alone can cause cancer. A methylated version of the p16 gene was associated with a wide variety of human cancers. The mouse model tested the association of the p16 gene with cancer by genetically engineering the p16 promoter which acted as a methylation magnet. As the mice reached adulthood, increased p16 methylation led to a higher incidence of spontaneous cancers, and reduced survival. ← Aspergillus resistance to fungicide detected.